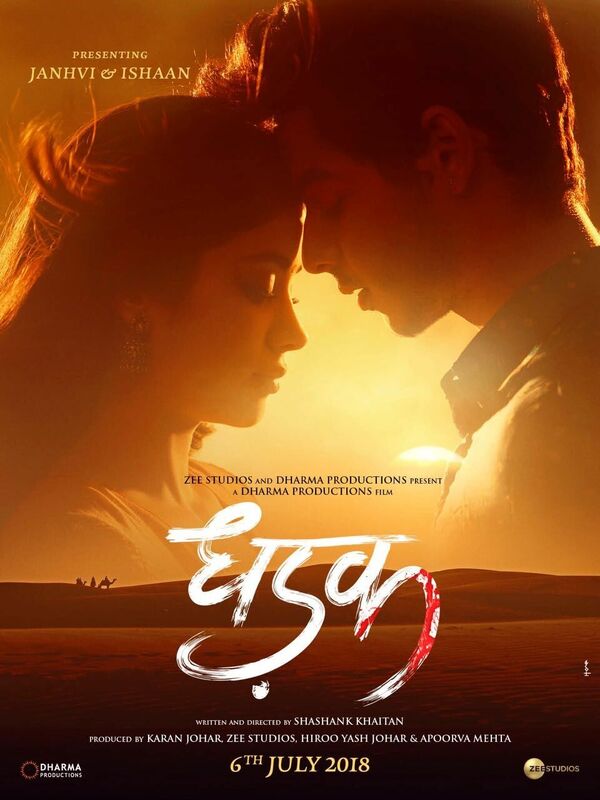 Like all great love stories Dhadak ends as a tragedy. Which is not to say that it is a great love story. Replicating, almost echoing all the conventions of a love-at-first-sight-doom-at-a-later-stage yarn Dhadak makes all the right noises (includes a super-melodious title song) and is still unable to create a concordant musical symphony. What goes wrong? Well, for one this Karan Johar production has resolved to do a Kuch Kuch Hota Hai on Sairat, the hardhitting Marathi film on which Dhadak is based. The remake extracts all the juice from the original and then squanders it in irrelevant plot conversions. The changes made in the original made no sense to me. Before I could exclaim, ‘Burp Re Burp’ after the eating contest big-time passion erupts between the rich politician Ashutosh Rana’s haughty daughter Parthavi (Janhavi Kapoor) and the affable boy next door Madhukar (Ishaan Khatter). Ishaan, God bless his effervescent spirit, is all over the place wooing and wowing the girl with all the tricks up his sleeve. He is like a peacock in Udaipur trying to impress his partner during the mating season. And very effective at that. Ishaan carries the film, which is stricken by underwhelming performances. The heroine’s docile mother in Sairat left a mark in spite of her limited dialogues. Her counterpart in this film is stuck with her artificial anxieties and fake makeup. Janhavi Kapoor has a quiet charm about her. But she has a long way to go. She is effective in the scenes after the elopement when she has to cope with “poverty” and “hardships”. That is, Karan Johar’s concept of poverty which means the couple has to slum it out in Kolkata with a kindly Bengali couple serving as their guardian angels. This brings me to the cinematography. Vishnu Rao shoots Udaipur and Kolkata like entries on tourist brochure. A mediocre film, like Lion, captured the brutal dispassion of The City Of Joy. Dhadak changes characters as if they were in Sairat it was a benevolent Auntyji from the slums who gave the on-the-run couple a room and respite. The rawness and immediacy of the original is completely lost in the remake as the protagonists seem to subscribe to the plot ideas from Sairat without being able to fit them into the environment provided in the remake. The finale, which shocked everyone in Sairat here seems force-fed to serve up a brutal lesson on honour killing. If I say, nothing in the film prepares us for the gruesome ending I don’t mean it as a compliment. If Dhadak is still watchable in parts it’s because Ishaan Khatter is constantly injecting his exuberant conviction into every scene. He doesn’t question why things are what they are. He trapezes across the tides of designer wear-and-tear hoping the doomed love story would finally make sense. Tragically, it doesn’t. The situations and incidents seem way too artificial in this South Bombay version of a Marathi film that changed the course of regional cinema. Dhadak changes nothing. It aspires to serenade the status quo with the sole purpose of launching Sridevi’s daughter. But why Sairat? Karan Johar could’ve chose any story. This is a pointless remake, more remarkable for what it fails to achieve with the original than what it actually manages to put forward.